Mar Joy Alappatt was born at Parappukara, in Thrissur district, Kerala, India, on September 27, 1956 as the second son of late Mr. Varghese and late Mrs. Rosy Alappatt. He has two brothers and two sisters. His baptismal name is John and he is named after the patron saint of his parish, St John Nepomucene. He is commonly known as Fr Joy Alappatt He had his primary School at St George Lower Primary School, Puthenpally, Varapuzha; his Upper Primary School at A.U.P.S., Parappukkara, and his high school at P.V.S. High School, Parapukkara. He joined the St Mary's Minor Seminary, Thope, Thrissur, after his high school. He completed his major seminary at St Thomas Apostolic Seminary, Vadavathoor, Kottayam. He was ordained priest by Mar James Pazhayattil on December 31,1981 for the diocese of Irinjalakuda. He served as Assistant Parish Priest at Chalakudy, Mala, and St Thomas Cathedral, Irinjalakuda. He earned his Masters in Theology from St Joseph's Pontifical Institute, Aluva. He completed his Masters in Sociology from Andhra University. He served as a Chaplain and Mission Director of SyroMalabar community in Chennai, Tamil Nadu, India for six years from 1987 to 1993. He came to the United States in 1994 and served as Associate Pastor in Staten Island, New York and New Milford, New Jersey. He completed his Clinical Pastoral Education Program and worked at Georgetown University, Washington, DC, as a certified Chaplain. 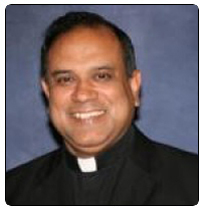 He was invited by Mar Jacob Angadiath in 2001 to serve in the St. Thomas Syro-Malabar Catholic Diocese of Chicago and he was appointed as the Director of Syro-Malabar Mission of Garfield, Newark and Administrator of Our Lady of Sorrows Church, Garfield. He was the Convener of Syro-Malabar Convention 2003, New Jersey. He has been serving as the Pastor (Vicar) of the Mar Thoma Sleeha SyroMalabar Catholic Cathedral, Chicago, Illinois since August 2011. He has written lyrics for several Christian devotional songs and published a few music albums. He is a known retreat preacher, an effective pastor with efficient administrative skills. He was ordained bishop on 27 September 2014.